The forests of Western North Carolina are threatened by a wide variety of environmental stressors and disturbances, such as insects, disease, invasive species, drought, fire, hurricanes, tornadoes, and ice storms. A stressor is any kind of event or action which, at certain levels, causes stress to organisms; for example, a period of drought. A disturbance is a relatively discrete event in time that disrupts ecosystem, community, or population structure and changes resources, substrate availability, or the physical environment; for example, a wildfire. Organisms may adapt to a level of disturbance, but when another threshold is exceeded degradation occurs. Degradation is the destruction of complex natural environments. When one ecosystem is under attack as a result of natural or man-made events, it is extremely difficult to calculate the ripple effects throughout the natural system. Sometimes stress, disturbance, and degradation occur individually, but more often they come in combination. The resulting effects can be severe and cause significant, lasting impact on ecological and socioeconomic values. To effectively sustain the ecosystem, there is a need to integrate how we deal with interacting, multiple threats so that land managers may anticipate disturbances and act to prevent or lessen the effects, or restore either the structure or the function of affected ecosystems. Insects and pathogens are a natural part of ecosystems and are essential to ecological balance in natural forests. Population dynamics of insects and pathogens are influenced by climate, management activities, natural tree defenses, and natural enemies. Trees can be weakened by a disease or an insect, and that weakened tree is then more vulnerable to insects, disease, and changes in temperature and precipitation. The effect on forested landscapes can be tree mortality and/or reduced tree vigor. Examining trends of individual insect and pathogen populations is useful in understanding their dynamic nature. Over the last century, several forest types in the region have experienced significant declines due to infestations of insects and diseases. Invasive plants are introduced accidently into a natural system or brought into an area for ornamental use, food or medicinal use, living fences, or livestock forage. They multiply rapidly because they are not kept in check by insects and diseases that evolved with them in their native setting. Extensive landscape disturbances over the past century have allowed invasive plants to impede the functions of native systems. The first invasive species undoubtedly arrived with European settlement 400 years ago. Many species have become so familiar that the public no longer recognizes their exotic and invasive behavior; for example, Japanese honeysuckle and starlings. More recently, the tempo of new introductions has increased with global trade, often accidentally through shipments of other cargo. Western North Carolina, with its variety of climates and growing conditions, provides fertile ground for these plants. With their rapid early growth and dense infestations, invasive plants alter the ecology of forests, affecting water and soil quality and causing declines in both the numbers and diversity of native species. Non-native imported species literally overrun native plants, creating unique new habitats amenable to yet more invasive plants. Shrubs can actually retard or stop hardwood regeneration and prevent forests from forming. Vines climbing over native vegetation block sunlight and break small trees. Grasses form dense impenetrable mats. Herbs can release chemicals to exclude other species. Due to the harmful impacts of invasive species to existing ecosystems, federal agencies have identified them as the second most important threat to the natural environment in the United States, behind only habitat destruction. 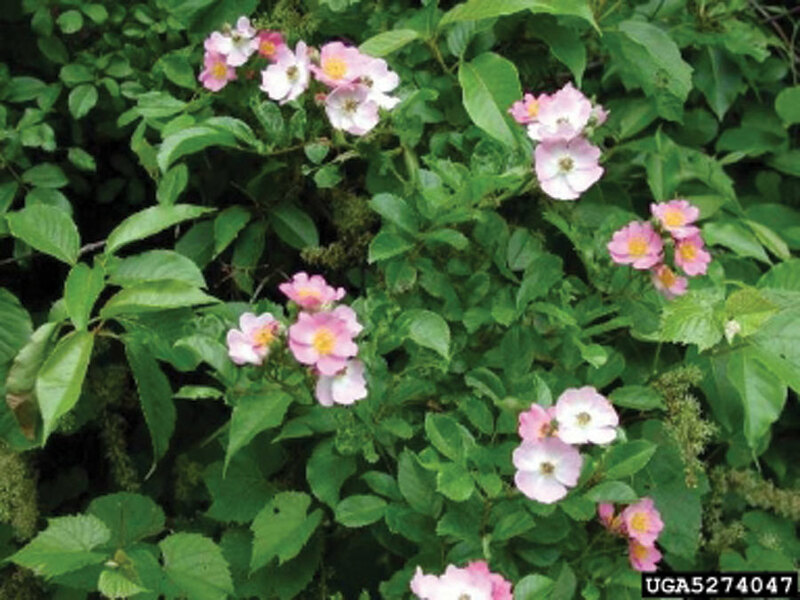 Invasive plants are a major threat to parks and forests, greenways, and gardens, as well as endangered species. It is important to note that not all non-native plants are considered harmful or invasive. Over 15 percent of the flora found in the southern Appalachian mountains is not native to the region. However, only a few of these plants are considered invasive. The majority of the non-native plants have naturalized and are not considered harmful to natural ecosystems. 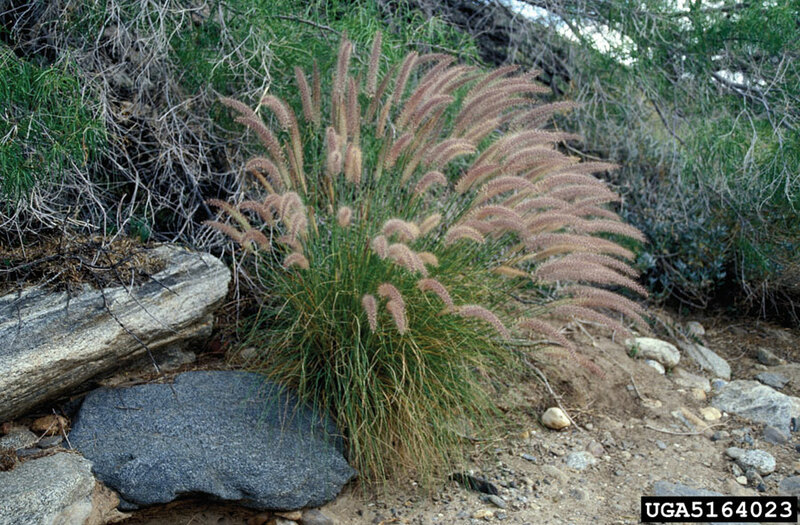 Criteria suggested for classifying a plant as an invasive species include plants that alter ecosystem functions (e.g., increase fire likelihood or alter hydrologic flows), become established in undisturbed natural communities, outcompete native species after a natural disturbance, and prevent or depress the regeneration of native species. Invasive species are opportunists. They cross all ownerships and therefore require a cooperative approach to treatment, control, and eradication. Preventing introductions, choosing which species to battle, mitigating impacts, restoring native ecosystems, and managing new ecosystems are all issues that need to be addressed. The National Forests in North Carolina have adopted a strategy to annually treat up to 1,100 acres of non-native invasive plants using manual and chemical treatments. Sites prioritized for treatment include legally designated rare species, rare plant communities, and/or areas including unique habitats. Trees. 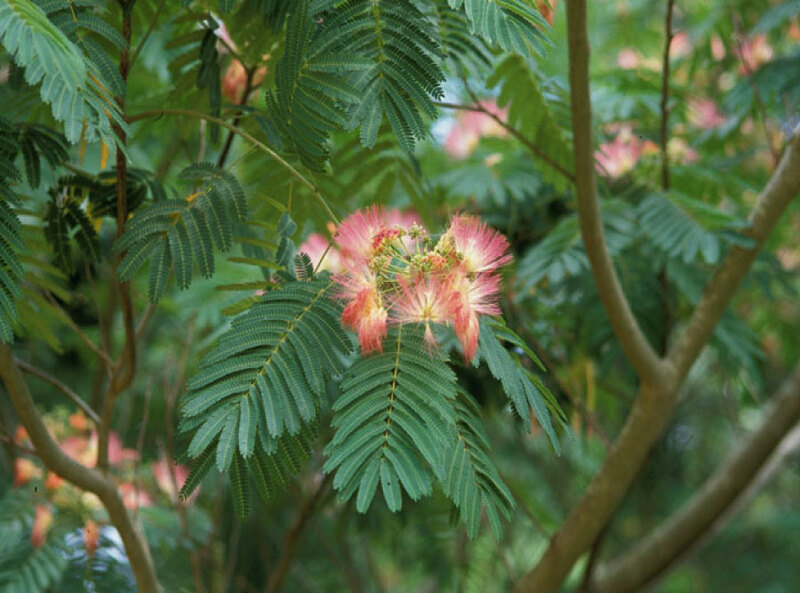 Invasive trees include princess tree (Paulownia tomentosa), tree of heaven (Ailanthus altissima), and mimosa (Albizia julibrissin). Common around old homes, on roadsides, riparian areas, and forest margins, these trees seed prolifically and spread rapidly by wind and water. They invade after disturbances and form colonies in a wide range of soil conditions. 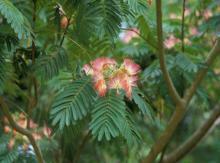 Mimosa is seldom found in forests with full canopy cover or at elevations above 3,000 feet. It can, however, become a serious problem along riparian areas. Princess tree, in contrast, can occur from low to mid elevations and are found along open riparian areas and particularly in dry sites with recent intense fires. Shrubs. Many invasive shrubs were introduced in the late 1800s as ornamentals, living fence rows, or to control erosion. They continue to invade a variety of habitats including fields, forests, stream banks, and many disturbed areas. Once established, they form dense stands that displace native vegetation and close open areas. These plants include multiflora rose (Rosa multiflora), Japanese spiraea (Spiraea japonica), autumn olive (Elaeagnus umbellata), Chinese (Ligustrum vulgare) and European privet (Ligustrum vulgare), and Japanese knotweed (Fallopia japonica var.japonica). Other less widespread shrubs, although still damaging in select locations, include Japanese barberry (Berberis thunbergii), butterfly bush (Buddleja davidii) and winged burning bush (Euonymus alatus). Vines. 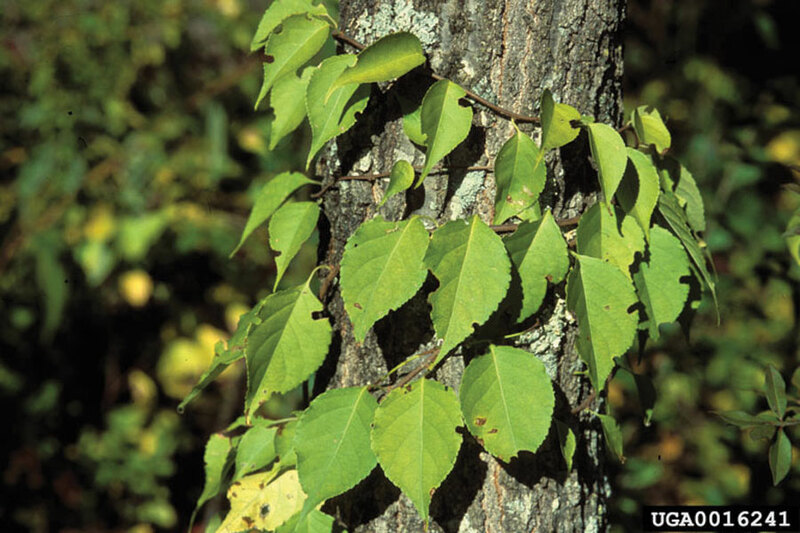 Invasive vines severely damage and can ultimately kill vegetation by climbing over native shrubs and trees and shading them out, constricting and girdling stems, forming dense thickets, and consuming their habitat. Invasive vines in Western North Carolina include Chinese yam (Dioscorea polystachya), Oriental bittersweet (Celastrus orbiculatus), kudzu (Pueraria montana), Japanese honeysuckle (Lonicera japonica), and porcelain-berry (Ampelopsis brevipedunculata). Less damaging but still of concern are periwinkle (Vinca minor) and English ivy (Hedera helix). Grasses. Invasive grasses include Japanese stiltgrass (Microstegium vimineum) and Chinese silvergrass (Miscanthus sinensis). These tufted grasses multiply to form extensive patches, displacing native species that are not able to compete with them. Japanese stiltgrass is found in damp areas such as Southern Appalachian bogs. Chinese silvergrass is more typical of drier sites and can present a fire hazard as it is highly flammable. Invasive herbs originally cultivated for food, medicinal, or horticultural use include garlic mustard (Alliaria petiolata), coltsfoot (Tussilago farfara), and spotted knapweed (Centaurea stoebe spp. micrauthos). Bir, R.E. February 2000. “Invasive plants and the nursery industry.” In Proceedings of the International Plants Propagators Society. Fletcher, NC: North Carolina State University. USDA Forest Service and University of Georgia, Center for Invasive Species and Ecosystem Health. Non-native invasive species in southern forest and grassland ecosystems. Accessed from: http://www.invasive.org/. Franklin, Misty (compiler). 2006. Invasive Exotic Species List. North Carolina Natural Plant Society. Accessed from: http://www.ncwildflower.org/invasives/list.htm. USDA Forest Service, Southern Research Station. Spring 2005. “Silent invaders of our southern forests,” Compass 1(2). Mimosa: James H. Miller, USDA Forest Service, Bugwood.org. Multiflora rose: Leslie J. Mehrhoff, University of Connecticut, Bugwood.org. Oriental bittersweet: James H. Miller, USDA Forest Service, Bugwood.org. Crimson fountaingrass: John M. Randall, The Nature Conservancy, Bugwood.org.